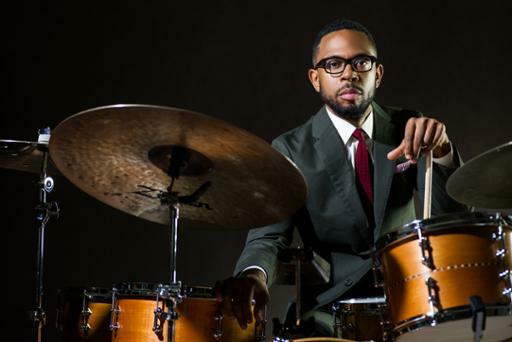 New York-based drummer Jerome Jennings is packing his drumsticks to participate in Tri-C JazzFest Cleveland’s Flying Home series presented by Cuyahoga Community College (Tri-C®). Jennings heads a group of musicians staging a special performance at 4 p.m. Sunday, Feb. 17, at East Cleveland Public Library, located at 14101 Euclid Ave. The Flying Home series, sponsored in large part by the George Gund Foundation, is a special concert series featuring former Tri-C students now making their mark as jazz performers across the United States. Jennings participated in Tri-C’s jazz programs from 1999 through 2003. He later graduated from Rutgers University and earned a master’s degree from The Juilliard School, where he now serves as resident director of The Juilliard Jazz Orchestra. Early in his career he toured with jazz giants Sonny Rollins and Hank Jones. Currently, he leads his own sextet and performs with the Christian McBride Big Band and Christian Sands Trio. His 2016 debut, The Beast, was named a Top Three jazz release by NPR. Jennings will be joined onstage at the East Cleveland Public Library by saxophonist Stacy Dillard, trumpeter Drew Anderson, trombonist Andrae Murchison, bassist Endea Owens and pianist Miki Hayama. The concert is free of charge, and seating is on a first-come, first-served basis. Doors will open at 3 p.m.
For more information on JazzFest or the Flying Home series, visit www.tri-cjazzfest.com. The series is part of the 40th anniversary celebration of the annual festival. Tri-C JazzFest Cleveland is presented by KeyBank and made possible by Cuyahoga Community College, the National Endowment for the Arts, Ohio Arts Council, Strassman Insurance Services Inc. and a growing list of donors and members.